The 2000s were an exciting time for USC football. An unsuspecting fan wandering into the Coliseum on any given Saturday could be blindsided by the electrifying offensive play of the Trojans. Points came a dime-a-dozen, yardage climbed to astronomical heights and sensational plays unfolded from the most basic formations. USC seemed to be able to score touchdowns in a matter of minutes, stretching the field until the defense was rendered useless. It was not rare to see receiver Damian Williams running a 40-yard post route every third series, or Dwayne Jarrett using his speed to outpace single-coverage straight down the field. USC had offensive talent, and it wasn’t afraid to push its limits. If that fan were to walk into the Coliseum today, chances are he or she would be significantly less impressed. Sure, some extremely talented players have come and gone, many of whom are now enshrined in Heritage Hall (and don’t forget Reggie Bush, either). But their departure is not the reason today’s Trojans lack that same offensive explosion — USC has all but exchanged those pieces with adequate replacements. Junior quarterback Matt Barkley was the highest ranked quarterback coming out of high school, and has been surrounded by blue-chip wide receivers and running backs since he first stepped onto the field. Almost every offensive starter has shown shades of brilliance at one point or another, testaments to their unparalleled abilities. So what are the current Trojans missing? A simple backing of confidence from their head coach. After two consecutive second-half flops in which the offense traded the deep pass for a bubble screen, it has become glaringly obvious that USC coach Lane Kiffin doesn’t fully trust his players — or himself — to stretch out the field as the game drags on. Just one look at the Trojans’ second-half drives this season and the issue presents itself: four consecutive drives of four plays or less, amounting to 31 total yards, against Utah to end the game. Against Minnesota, USC still had to punt three consecutive times to end the game while only running 20 cumulative plays in the second half. Meanwhile, during both of these situations, the Trojans’ opponent scored to bring the game within a field goal. That hardly seems like a good way to seal a victory late. If this were last season, with Kiffin at the helm of USC for the first time and a 15-33 career record in college and the pros to show for his few years of experience, it would make sense to be conservative. And he certainly was last year, in his play calling and in his handling of the sanctions to the media and to fans. He didn’t want to stick out, but rather, he wanted to go about business as usual at a time when it was anything but. But it is no longer that time. 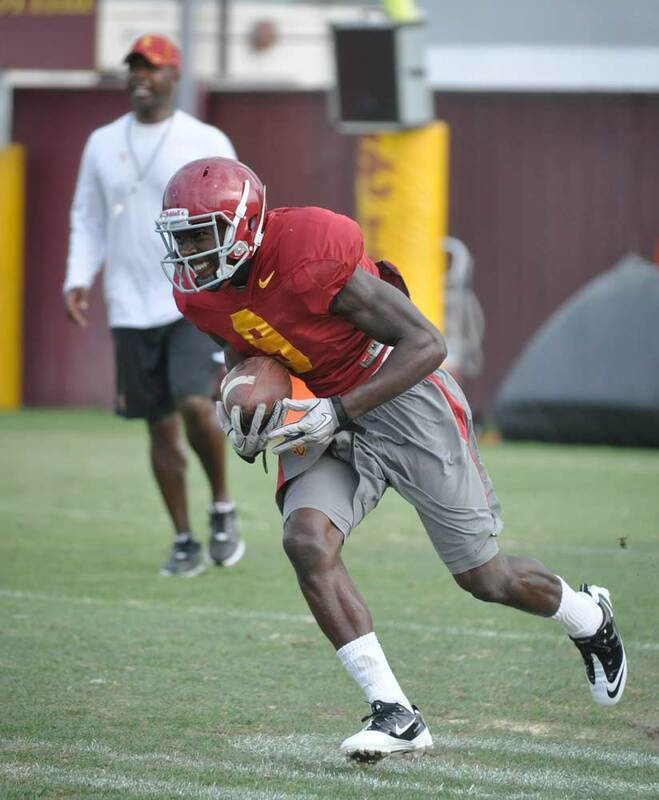 One glance at USC’s offense and it is easy to see talent all over the field. The Trojans have a Heisman-caliber quarterback throwing to one of the best receiving corps in the nation, and have backed their talents with significant growth in maturity, focus and preparation. So what is the holdup? With advantages this apparent, USC needs to once again start doing what brought it so much success in the recent past — airing it out. That might be dumbing it down, but the situation really is a simple one. Exploiting the Trojans’ size, speed and physical advantage downfield will pay dividends over the course of the game. And if Kiffin wants to continue to steadily work USC’s backfield in the mix, spreading the opponent’s secondary will only help USC’s running game by unclogging the box. The Trojans are executing their game plan better than expected for the start of their season. The only problem is the game plan itself hasn’t held up for all four quarters. Kiffin has put together a team that has the potential to get the program back to where it was last decade. But in order to take the next step toward success, he will first have to shed the uncertainty preventing the Trojans from continuing to light up the scoreboard. “One-Two Punch” runs Tuesdays. To comment on this article, visit dailytrojan.com or email James at jbianchi@usc.edu.